What is it? Spool is like Instapaper or Read it Later for video. It allows you to to save videos to watch later. How is it of use to journalists? How many times have you come across a video on a news site or YouTube when you don’t have the time to watch it? Spool allows you to save videos you’ve found during the day for viewing later. And what is great about it is that it records the video, allowing you to watch it offline, perhaps on the train home from work. It saves it in HTML5 so videos or documents that started as Flash can be viewed on an Apple device. Spool is not just for video – it allows you to save any webpage – but it is video that sets it apart from similar platforms for saving news articles. 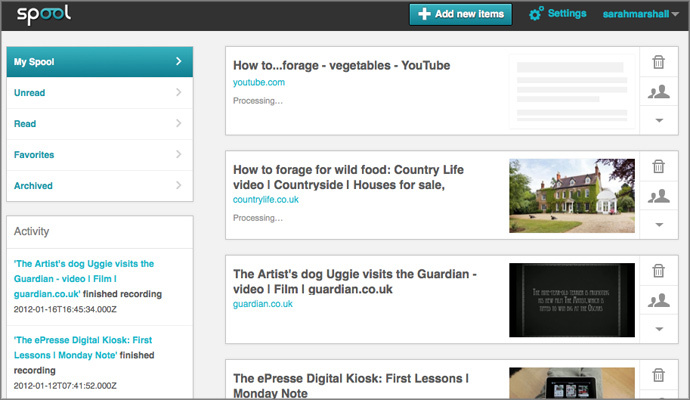 You can also add the option of saving the videos, articles and documents to Dropbox or Evernote. Spool has iPhone/iPad and Android apps to access your saved videos and to allow you to save more. It is still in private beta and requires you to apply for an invitation. These appear to be sent out almost immediately. This entry was posted in Multimedia, Tool of the Week and tagged Instapaper, read it later, spool, Video on January 17, 2012 by Sarah Marshall.